The Spanish government is encouraging Catalonia’s sacked leader Carles Puigdemont to take part in new elections it is holding there in December. Puigdemont has called for “democratic opposition” to the direct rule imposed in Catalonia following Friday’s unilateral declaration of independence. Madrid says he should take his message to the polls. “He has no powers, no competences and no financial means so I insist that if he wants to continue in politics, which is his right, I think he should prepare for the next elections to be held, as I mentioned before, on December 21, and there he can exercise this democratic opposition,” said Spanish government spokesman Inigo Mendez de Vigo. Until the elections, Spanish Deputy Prime Minister Soraya Saenz de Santamaria has been officially put in charge of Catalonia. Under constitional powers, the government of the autonomous region has been dismissed, its parliament dissolved, and the president of the assembly stripped of all but symbolic powers. Friday’s announcement in parliament of a unilateral split from Spain could see Puigdemont facing prosecution in the courts. 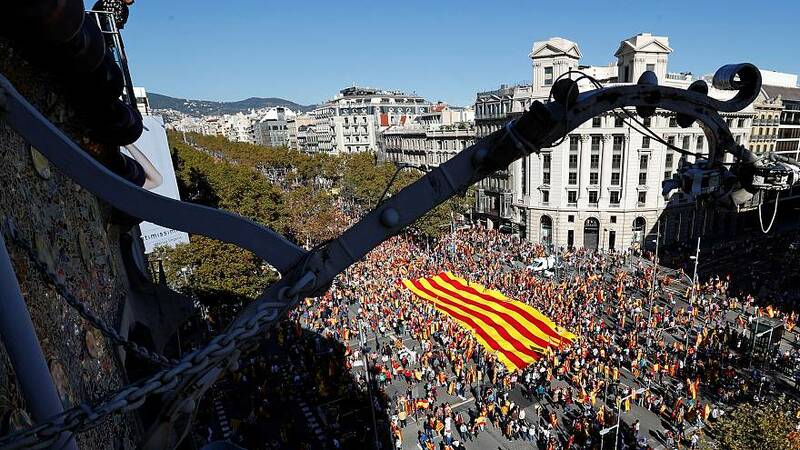 While separatists are still celebrating the declaration, supporters of Spanish unity have been taking to the streets, on Saturday in Madrid and on Sunday in Barcelona. For while this month’s referendum in Catalonia endorsed independence, turnout was just 43 percent and those against a breakaway largely stayed at home.